In Europe, cryptocurrency mining is legal and it is subjected to standard energy consumption rules as per the EU commissioner. Last week, Mariya Gabriel (Digital Economy and Society Commissioner, Europe) has addressed the concerns on intensive power consumption of Bitcoin and cryptocurrency mining as well as clarified the crypto industry’s regulatory status. Though, as mining is an energy-consuming economic activity, it subject to the European rules concerning “electricity sector, greenhouse gases emissions, and energy efficiency” added Gabriel. In addition, she added that the Commission of Europe will continue to track the cryptocurrencies’ growing impact on the demand and energy consumption. 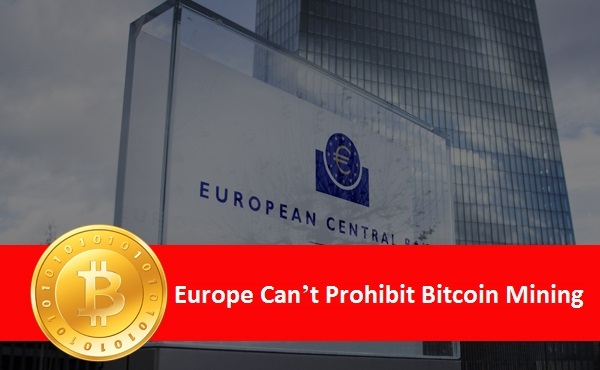 Further, the European commissioner said that it is not clear how Bitcoin and other cryptocurrency mining will be carried out in the Europe. Also, she made a point by saying that currently, mining activity has a major concentration in China, in spite she hinted that regulators in China might move. “Nonetheless, we can’t ignore the fact that some of the cryptocurrency mining takes place in the Europe too,” Gabriel said. The Washington Post reported recently that Iceland generates a huge amount of electricity via hydroelectric stations currently possesses more altcoin mining projects as compared to the total energy supply supported by the island. Although, Iceland is European Economic Area’s part and not a European member. Some of the experts told ‘The Washington Post’ that only Bitcoin mining consumes around 0.14 percent of generated power supply across the world which is a big problem. The blockchain experts believes that a great incentive should be created for legitimate energy solutions’ experiments.